Amitabh Harivansh Bachchan, commonly known as Amitabh Bachchan, is a famous Indian voice actor, actor, musician, as well as a television producer. Amitabh Bachchan rose to prominence by starring in various Bollywood productions, the most famous being a crime-drama directed by Yash Chopra called “Deewar”, and in a Hindi action-thriller film entitled “Zanjeer”. Considered to be one of the best actors in the history of Indian cinema, Amitabh Bachchan has starred in more than 180 Indian film productions, and dominated the film scene in 1970s and 1980s. For his contributions to the film industry, Amitabh Bachchan has been awarded with several national honors, including “Living Legend” award, Awadh Samman, and NTR National Award, as well as National Film Awards, Filmfare Awards, Screen Awards, and Bollywood Movie Awards. Bachchan also received the fourth highest civilian award in the Republic of India called “Padma Shri”. Amitabh Bachchan achieved more international recognition and success when he portrayed the character of Meyer Wolfsheim in Baz Luhrmann’s drama film entitled “The Great Gatsby”, where he co-starred with Leonardo DiCaprio, Tobey Maguire, Isla Fisher and Jason Clarke. A box office hit with more than $351 million grossed around the world, “The Great Gatsby” was Amitabh Bachchan’s Hollywood debut. In current news, Amitabh Bachchan is scheduled to appear in several Bollywood productions, including an upcoming movie “Welcome Back” and a Hindi film called “Piku”. A famous actor, how rich is Amitabh Bachchan? According to sources, Amitabh Bachchan’s net worth is estimated to be a remarkable $400 million. Undoubtedly, most of Amitabh Bachchan’s net worth and wealth comes from his acting career. Amitabh Bachchan was born in 1942, in United Provinces, British India. Bachchan studied at the Sherwood College and later continued his studies in the Delhi University. Bachchan’s film debut was in an award-winning Hindi film called “Bhuvan Shome”, where he was a voice narrator. Shortly after that, Amitabh Bachchan landed his very first film role in a movie directed and written by Khwaja Ahmad Abbas called “Saat Hindustani”. Two years after his debut on television screens, Bachchan rose to stardom in an action-thriller film “Zanjeer”, which brought him a lot of commercial success. Bachchan’s role in this movie is considered to be one of the most legendary roles in the history of Bollywood. Amitabh Bachchan’s remarkable performance in “Zanjeer” landed him many award-winning and commercially successful roles, including appearances in such films as “Namak Haraam”, “Deewar”, and “The Great Gambler” to name a few. Even though Amitabh Bachchan was most famous during 1970s and 1980s, he returned to prominence in 2000, when he starred alongside Shahrukh Khan in a film produced by Yash Chopra called “Mohabbatein”. A critical and commercial success with more than 741 million rupees grossed in the box office, “Mohabbatein” signified Amitabh Bachchan’s return to the dominance of the Indian movie scene. Bachchan then went on to make his first international movie appearance in Mira Nair’s film called “Shantaram”, where the main character was portrayed by Johnny Depp. A famous actor, Amitabh Bachchan has an estimated net worth of $400 million. 1 Rajesh Khanna for me will remain the only superstar in true sense. He appeared in 153 films by 1991 - that is in a span of 25 years which already included 101 solo hero films and did only 21 multi star-cast films. Everyone knows his involvement in music of his films.He was so hardworking that each year he had minimum 3 films releasing and still managed to give 95 jubilee hits!! Hats off to him. My achievements are no-where near him. In-fact I did more multi star-cast films and less solo hero films than him. Once i got success in angry young man genre I had to stick to it and whenever I tried to do something different it was a failure so I stayed away from experimenting much. But Khanna never bothered about such things. In-spite of not working much after 1991 he has done 180 films and Am far behind him. I have highest regards for him since the 1965 when I heard about him then my respect only increased when I worked with him and till date I regard him as a greater actor. 2 (1991) It was a dream come true for me because of there was this great admiration for Kaka and his phenomenal success. The hysteria that he evoked was witnessed for first time in Hindi Films. And we were all part of that hysteria that followed Kaka. I got famous purely because I was working with Rajesh Khanna. People came and asked me questions like "How does he look?" So I became very important, thanks to Kaka. I have always maintained that person who is my senior will always remain senior. I have never argued about billings because I don't think they mean anything. And I have had always greatest respect for Kaka. 3 (2000) Whether it was in sets of Anand or Namak Haram, we never bickered or argued or tried to upstage one another in any manner. On the contrary Kaka does'n know this, but when I was working in Calcutta and keen to join films, the inspiration to join was Mr. Rajesh Khanna. Kaka had succeeded in Filmfare contest and I said "My God, here is an excellent opportunity where somebody is actually auditioned and here this gentleman who has made it and is doing so well." Then wonder of wonders in 2 years Hrishida asked to work with Kaka. It was a dream come true for me. 4 His thoughts on working in Hollywood: "You don't see Indians in Hollywood films around which a story can revolve. As soon as we have a social presence in your society, I am sure there will be many actors from our part of the world that will be acting in Hollywood films. I have always been a great admirer of Marlon Brando, Al Paccinno, Robert De Niro. I would love to walk into the frame, hold their briefcase!" 5 The amount of things I have been through and the remarkable ways in which the body has reacted is just phenomenal. No wonder I became religious, because you don't know why something's happening to you and you don't know how you bounced back. 6 (Referring to Abhishek Bachchan) "Like any other father I feel proud to see my son on the silver screen." 7 I wish I had time to learn all the languages of our country, I wish I knew how to play a musical instrument. There are many things that I feel I have missed out on. 8 Everyone must accept "that we will age and age is not always flattering". 9 I have never really been confident about my career at any stage. 1 Producer Debesh Ghosh, director Hrishikesh Mukherjee and Amitabh Bachchan worked a lot together. The same team before had made ' Jurmana' and Bemisaal together. The same team were to make the 3rd film together. It was launched in 1982 and it was titled ' Auqaat ' with Amiitabh Bachchan, Jaya Pradha & Anita Raaj, but was then shelved due to Amitabh's accident on ' Coolie' sets. 2 In 1969, he was engaged with a air hostess for British Airways. Her name was Maya. 3 When Kamaal Amrohi wanted to research about the film Razia Sultan ,he found the book about Raziia Sultan. in Paris, France, This film took 8 years to complete. After Pakeezah Kamal Mmrohi started the film and also he was the producer of this film, Amitabh Bachchan was to play Dharmendra's role and Kabir Bedi Vijendra's role. Then A. K..Mishra became the producer of the film and the shooting started with Dharmendra. After 8 years when Kamal Amrohi went to Hollywood for the special effects of the film. Kabir Bed was surprised to see Kamal there and to know the film not completed yet. 4 Actress Tillotama Shome married his nephew Kunal Verma (Rita Bhaduri and Rajeev's son). 5 Aishwarya Rai was to pair opposite Ajay Devgan in a film that was to be produced by Amitabh Bachchan's production company ABCL. The yet untitled project was be based on a family oriented subject with Jaya Bachchan playing Ash's mother. It is learnt that actor Vinod Khanna and Mrs Bachchan play a separated couple in the movie. Amitabh Bachchan himself was not be seen acting in this film that was be produced by ABCL in association with Spice Team Entertainment. Sharbani Deodhar was directing the film. Amitabh Bachchan himself chose not to enact the lead role opposite Jaya because the two elderly characters in the movie are not shown married to one another. Vinod Khanna's name for the role was suggested by the Big B only. The film was likely to go on floors in September 2005. It was be shot in Mumbai and London. The film was shelved after announcement. 6 Starred in Raju Patel's shelved film "Tandoor".(2005). Starring Amitabh Bachchan as NRI gourmet chef in New York. He was to star opposite a Hollywood actress who was going to play a lawyer. The film was to be directed by Nagesh Kukunoor. The film got shelved due to disagreement on the films budget between Nagesh and Raju Patel. 7 Granddaughter Navya Naveli was born on December 6, 1997. Jaya Bachchan wanted to name her Garima. 8 Shammi Kapoor approached him for the lead role in Bundal Baaz. He declined as he didn't have any dates. 9 Starred in the shelved movie "Kutumb" (2004). Starring Amitabh Bachchan, Akshay Kumar, Abhishek Bachchan, Irrfan Khan. Produced by Firoz Nadiadwala and Directed by Vikram Bhatt (Replaced Mahesh Manjrekar).The film was based on the movie Godfather. 10 Starred in RituParno Ghosh's shelved untitled film. Staring Amitabh Bachchan, Shabana Azmi, Farhan Akhtar, Aishwarya Rai.The story was about a father who over shadows his son. This was in 2004. 11 Starred in BMB Productions shelved film "Bada Bhai" (1999). Starring Amitabh Bachchan, Sunny Deol, Jackie Shroff and Tabu. Produced and Directed by KC Bokadia. 12 Starred in the shelved film "Raftaar - No Way Out". Starring Amitabh Bachchan, John Abraham. Directed by Sriram Raghavan. This was in 2004. 13 Starred in Somnath Sen's shelved film opposite Madhuri Dixit. Fardeen Khan and Karan Nath were in talks for the second lead. This was in 2004. 14 Starred in the shelved movie "DOGS" (2004). starring Amitabh Bachchan, Rishi Kapoor. Many actress' s were approached for the lead role. Sushmita Sen, Diana Hayden, Rani Mukherjee. The film was to be directed by Mukul Abhyankar. The story line was about two brothers. Amitabh was to be a dog trainer who is banned from the dog training academy due to violent behavior. Rishi Kapoor is his younger brother who is mentally deranged. Problems start when Rishi Kapoor gets involved with a prostitute. As time goes by, the prostitute is more attracted to Amitabh than Rishi. 15 Producer's Vicky ( Abhay) Chopra and Sohail Khan were planning a film titled "Sena"(2004) . Starring Amitabh Bachchan, Hrithik Roshan, Abhishek Bachchan.Directed by Vicky Chopra.The film was shelved to start "Fight Club". 16 Starred in Sujoy Ghosh's shelved movie "Borivali"(2004). Co starring Nseeruddin Shah. 17 Starred in ABCL's shelved film " Happy Diwali" (2001). Starring Amitabh Bachchan, Aamir Khan, Rani Mukherjee. Directed by Mansoor Khan. 18 His father's first wife's name was Shyma. 19 Abhishek Bachchan and Amitabh Bachchan hold the Guinness World record for being the only father-son duo to have played reversed roles on-screen in Paa (2009). 20 Produced the shelved movie , Amitabh Bachchan Corporation Limited's "Loveria"(1998). Starring Saif Ali Khan,Karisma Kapoor,Mohnish Bahl,Ashok Saraf,Reema Lagoo,Reeta Bhadhuri,Rajiv Verma,Paresh Rawal,Rajesh Joshi, Music by Jatin -Lalit, Directed by Kundan Shah. 21 His niece Namrita Bachchan (daughter of Ajitabh) participated in a swimming marathon for charity with music composer legend, Biddu. 22 Sundar Popo song "Chadar Bichawo Balma" was a song that Amitabh Bachchan incorporated into his medleys on his live stage performances in 1982/83. 23 Apache Indian made reference to Amitabh Bachchan in his song " Movie Over India" in 1990. 24 Starred in I Dream Productions shelved film " Chanakya" co starring Akshay Kumar. This was in 2004. 25 Pran's son Sunil Sikand tried his hand at filmmaking. Sikand first announced "Karishma" in the '70s, a remake of "Reincarnation of Peter Proud" with Shashi Kapoor and Amitabh Bachchan, Praveen Babi,Danny DenZongpa, even before "Karz." The film was shelved after 3 months. Sunil Sikand then made "Farishta," a remake of "Oliver Twist" in which Pran played the title role. In 1991, Pran co-produced "Lakshmanrekha" for his son. 26 Starred in Bunty Walia' s shelved film "Just Punjabi" directed by Apoorva Lakhia. Co starring Sanjay Dutt. The films storyline was similar to Jo Bole So Nihal. 27 The first ever Amitabh Bachchan remix album ever released was titled " Garma Garam Amitabh Volume 1". It was released in 1990 and was remixed by England DJ's Amit and San J of X- Zecutive. The album consisted of a few of Amitabh's songs remixed and a lot of dialogs mixed with dance music. The dialogs were from the films, " Amar Akbar Anthony", " Sholay", "Naseeb","Ek Nazar", "Ganga Ki Saugandh","Kaalia", " Satte Pe Satta". The album was a major favorite in night clubs abroad in the 1990s. 28 Starred in Pramod Chakravorty's shelved film "Teen Farishtey" co starring Dharmendra and Vinod Khanna in 1975. It was later remade as "Jagir". 29 Starred in Prakash Mehra's shelved film "Kaayar". Co starring Anita Raaj and Raj Babbar. This was in the 1980s. Prakash Mehra shelved the film as he felt it was too similar to Manoj Kumar's Sanyasi. He restarted the film as Bal Brahmchari with Puru Rajkumar and Deepak Tijori in 1995. 30 Was approached by Subash Ghai to play Jackie Shroff's role in Saudagar. He declined as he felt the role was too small. 31 Was offered Sunny Deol's role in Dacait but turned it down. 32 Was signed for the film Kartoos opposite Meenakshi in 1987. The film financier's backed out as they did not want Amitabh to play a negative character. The film was later started again with Sanjay Dutt. 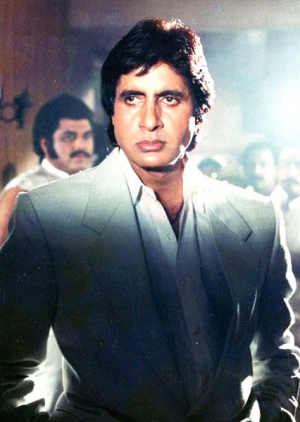 33 Feroz Khan had approached Amitabh Bachchan to play Mukesh Khanna's role in Yalgaar. Amitabh turned down the role as he did not want to play Feroz Khan's father. 34 Was to star in Sunil Bohra's shelved film "Yudh - The War Has Begun" in 2002, co-starring Chandrachur Singh, South Superstar Arjun, Deepti Bhatnagar, Sharad Kapoor. 35 Was to star in ABCL's "Dariya" directed by Priyadarshan, co starring Chandrachur Singh. Amitabh was to play a fisherman. The film got shelved. 36 Mother's birth name was Tejwant Kaur Suri. 37 Has 2 nephews. They are the children of actor Rajeev Verma, who is married to Jaya's sister Rita. The first nephew's name is Shiladitya Verma. He is a painter based in Bhopal. He is married to Poorvi Karanwar. The other nephew's name is Thathaghat Verma. He is a software engineer based in Mumbai. He is married to Darshika Mahajan. 38 Niece named Namrita Bachchan (Daughter of Ajitabh) who is a famous artist. 39 Niece's name is Nilima Bachchan. (Daughter of Ajitabh). She is a PhD in Aeronautica engineering in the UK. 40 Nephew name is Ravi Srivastava. He is the son of cousin Kishore Srivastava. 41 Niece named Naina Bachchan. ( Daughter of Ajitabh). She is married to actor Kunal Kapoor . 42 Cousin's names are Kishore Srivastava and Ashok Srivastava. They are the son's of Amitabh's dad's brother. 43 Brother in law's name is Harbhajan Singh (Cousin Harvinder Kaur's husband). 44 Niece's name is Leena Singh (Cousin Harvinder Kaur's daughter). 45 Cousin's name is Harvinder Kaur. She is Amitabh's mother's sister's daughter. Harvinder is 5 years younger to Amitabh. Her mother's name was Govind Kaur. 46 According to trade magazine Box Office India, the trend of early morning shows and advance bookings across cinemas in India, started due to craze for Amitabh Bachchan films from mid 1970s. The crowds would start queuing up as early as 5 AM in morning even though ticket counters normally opened at 11 AM. The queues for tickets of Amitabh Bachchan films would even extend upto 2-3 kilometers and cause traffic jams on roads. The craze among crowds was so massive that often police had to be called to manage the crowd. Such demand for a star's film has never been witnessed before or since. 47 In 1999, Amitabh Bachchan was named Megastar of the Millennium (male) in Kinetic Mega Show, a cinema based TV show on Star Plus channel, after public poll conducted over a year. 48 In the year 2000 Amitabh Bachchan was voted the 'Sherwoodian of the Century' in a poll of Old Sherwoodians. At a reunion of Old Sherwoodians held on November 10th, 2000, he received the 'Old Sherwoodians Millennium Award for Outstanding Achievement' at his alma mater Sherwood College boarding school in Nainital. 49 Until 1984 only 13 films were classified as "All time earners"(films that crossed 1 crore mark in every territory) by Trade, 9 films out of those were Amitabh Bachchan starrers - Sholay (1975) , Amar Akbar Anthony (1977) , Deewaar (1975) , Laawaris (1981) , Suhaag (1979) , Muqaddar Ka Sikandar (1978) , Andhaa Kanoon (1983) , Coolie (1983) and Naseeb (1981) . The other films were Jai Santoshi Maa (1975) , Dharam Veer (1977) , Ek Duuje Ke Liye (1981) and Kranti (1981) . The 1 crore mark was considered the magical benchmark for films in 70s and 80s and Amitabh Bachchan is the only star whose films consistently crossed 1 crore mark in every major territory across length and breadth of India. 50 As of 2008, Amitabh Bachchan was the all-time highest grossing Hindi film star with a cumulative box office revenue of over Rs 3,700 crore according to trade. (India Today - May 29, 2008). 51 Amitabh Bachchan and Dilip Kumar are the only Bollywood stars to have topped Box Office India Top Actors rankings for 16 consecutive years (from 1976 to 1991 and 1948 to 1963 respectively). 52 Starred in the shelved film "Pooja" in 1973. Directed by Mukul Dutt, co starring Waheeda Rehman and Sharmila Tagore. 53 He is the most-nominated performer in any major acting category at Filmfare Awards, with 39 nominations overall (30 nominations as Best Actor - a record; 9 nominations as Best Supporting Actor - also a record). He also has one Filmfare Award nomination for Best Playback Singer (male) for the song "Mere Paas Aao Mere Doston" for Mr Natwarlal (1979) and one Filmfare Award nomination as Producer for Best Film for Paa (2009). 54 After Janasheen, Feroz Khan was to start a film titled " Nasha" . The film was to star Feroz Khan, Amitabh Bachchan, Fardeen Khan , Aishwarya Rai and Lopsang. But Feroz decided to shelve the film and remake Kurbani. 55 Was considered for Gomti Ke Kinare for Sameer Khan's role. 56 Feroz Khan had initially approached Amitabh for the role of Amar in Qurbani. Amitabh's date's were blocked for Shaan and the deal fell through. 58 Brother-in-law of actor Rajeev Verma who is married Jaya Bhaduri's sister Rita Badhuri (not an actress). 59 Brother Ajitabh Bachchan has two children. A son named Bhim. A daughter named Naina. 60 Amitabh Bachchan gave a screen test for a film on the set of the 1969 movie, Sajan. This was before Bachchan had signed for any film. The screen test was arranged by Nargis Dutt. 61 Favorite actress is Megastar Waheeda Rehman. 62 Favorite actor is Megastar Dilip Kumar. 63 When Puneet Issar punched him on the sets of Coolie, the actor first bowed to the entire crew for a perfect shot before crumpling in pain outside minutes later. 64 He and Jaya got married a month before Abhimaan released. During the filming of Zanjeer, the cast and crew had decided to go abroad if the movie was a hit. As it was the first trip together for Amitabh and Jaya, he sought his father poet Harivansh Rai Bachchan's permission. His father asked if Jaya was going too. When Amitabh replied in the affirmative, he was told to marry her before they left the country. 65 He had 10 releases - including - 8 flops, one hit (Anand) and one above average grosser (Bombay to Goa) before his first big hit, Zanjeer (1973). Zanjeer made him a star and marked the beginning of the "Amitabh Bachchan Phenomenon". 66 Was first named Inquilaab. His mother, Teji Bachchan, was an active participant in the Satyagraha movement and, despite her pregnancy, she remained so committed to the cause that many friends of the Bachchans joked that the baby would be called Inquilab. And he was, till his father's friend, the poet and novelist Sumitra Nandan Pant, named him Amitabh which means unlimited. 67 Favourite onscreen name is Vijay. He has played a character called Vijay 19 times. 68 Amitabh Bachchan is the first Indian actor to be paid over Rs 1 crore in remuneration for films. Till 1990s, Amitabh Bachchan was the only star paid in crores. 69 In the 2008 movie, Slumdog Millionaire (2008), Amitabh Bachchan is the answer to Jamal's first question in the Indian version of Who Wants To Be A Millionaire? (Kaun Banega Crorepati? (2000)) The question: Who was the star in the 1973 hit film Zanjeer (1973)? Through Jamal's flashbacks we get to see Amitabh Bachchan in action. 71 His mom, Teji Bachchan, passed away in Lilavati Hospital, Mumbai, Maharashtra, India on December 22, 2007, after a prolonged illness, at the age of 93. 72 His daughter, Shweta, was born on March 17th. 73 His daughter, Shweta, is married to Nikhil Nanda, who is the grandson of Raj Kapoor. (Raj Kapoor's daughter, Ritu, took on the last name of Nanda when she married Rajan). 74 On 31 October 2006, he shocked the unit of a forthcoming movie Shootout at Lokhandwala by recording 23 scenes in 5 hours. Achieving this feat was unheard of. 76 He hates the word Bollywood, the word that describes the Hindi film industry. 77 Kader Khan wanted to direct him as the lead hero in Jaahil, unfortunately the movie was never made. 78 Vidhu Vinod Chopra wanted Amitabh Bachchan to play the lead role of Inspector Inayat Khan in Mission Kashmir (2000). The reason why Amitabh Bachchan declined the role was because of his commitment to Yash Chopra's Mohabbatein (2000). 79 Prakash Mehra was planning on making Chankaya Chanddragupta and had signed Amitabh Bachchan for the main role. The movie was shelved. 80 Amitabh Bachchan was the first choice of Rakesh Roshan's King Uncle (1993). But since the actor wasn't signing films then, Roshan opted for Jackie Shroff. 81 Amitabh Bachchan was supposed to play one of the lead roles in Shashi Kapoor's Utsav (1984) however; Amitabh opted out of the film. Shashi Kapoor replaced him. 82 Amitabh Bachchan, Parveen Babi, Mithun Chakraborty and Rati Agnihotri were teamed in Tala Chabi, produced by Romu Sippy and directed by Raj N. Sippy. One of the foremost character actors then, Pran, had been signed to enact the main villain's role. An official announcement was made in April 1982. The movie never took off. 83 In 1976 Amitabh Bachchan was to star in Manoj Kumar's Naya Bharat, alongside Amitabh it was also supposed to star Manoj Kumar, Hema Malini, Rajesh Khanna, Shashi Kapoor, Shatrughan Sinha, Zeenat Aman and Rishi Kapoor. The film was shelved subsequently. 84 Amitabh Bachchan and Dilip Kumar were seen on screen for the first time in Ramesh Sippy's Shakti (1982). But much before Shakti happened, Eagle Films had signed Dilip Kumar, Amitabh Bachchan and Amjad Khan for their new project, which was to be directed by Yash Chopra. However, the project did not materialize subsequently. 85 Rakesh Kumar, who had directed Khoon Pasina (1977), Mr. Natwarlal (1979), Do Aur Do Paanch (1980) and Yaarana (1981), had turned producer and announced Charlie, with Amitabh Bachchan enacting the title role. Padmini Kolhapure had been cast opposite the Big B. However, the project never got made. 86 Although Amitabh Bachchan's Immaan Dharam (1977) proved to be a disaster, the producer went ahead and announced Asmaan with Dharmendra, Amitabh Bachchan and Rekha, with Mohan Kumar in the director's seat. Salim-Javed, who had penned the script of Immaan Dharam, were scripting Asmaan as well. However, the film was shelved subsequently. 88 Won the National Award for Best Newcomer for Saat Hindustani (1969). 89 He played double role in 10 films Aadalat (1976), Don (1978), Kasme Vaade (1978), The Great Gambler (1979), Desh Premee (1982), Satte Pe Satta (1982), Aakhree Raasta (1986), Bade Miyan Chote Miyan (1998), Lal Baadshah (1999) and Sooryavansham (1999). Mahaan (1983) had him in a triple role. 90 In 1984, he was honored by the Indian government with the Padma Shri Award for his outstanding contribution to the Hindi film industry. 91 In 1996, he released an album called "Aby Baby". This album was released under ABCL and featured songs like "Eer Bir Phatte" and remixes of his songs from his early movies "O Saathi Re" and "Kabhi Kabhi". "Eer Bir Phatte" was inspired by one of his famous dialogues in his movie Aadalat (1976). 92 At the age of 58, he jumped from a height of 30 feet, along with co-star Manoj Bajpai, for his 2001 movie Aks (2001). 93 Singer Sudesh Bhonsle dubs his voice for playback songs in many movies. 94 Following a near fatal accident while shooting Coolie (1983), during which he suffered internal bleeding and required 17 bottles of blood, he became a champion for the cause of encouraging more people to donate blood. 95 The facial caricature of the Indian comic book character 'Supremo' is based upon him. 96 Has a double M.A. (Master of Arts) degree. 97 Actress Nirupa Roy is mostly cast as his mother and last time she featured was in Lal Baadshah (1999). 98 On his 61st birthday, he relaunched ABCL as AB Corp. ABCL had to be closed after debts of more than millions of rupees. However, Amitabh has decided to relaunch it with a name change. 99 His father Harivansh Rai Bachchan was considering naming him 'Inquilab' (which means 'revolution') before settling down for Amitabh which means 'brilliance unlimited'. 100 His favourite screen name is Vijay, which he had as his character name in over 20 movies. 102 Son of celebrated Indian poet Harivansh Rai Bachchan, who passed away in January 2003. 103 Works with the Indian government's media campaign to publicize the National Immunization Days and encourage people to take their children to be vaccinated against polio and other deadly diseases. 104 Became a grandfather in 1997 when his daughter Shweta gave birth to a daughter, Navya Naveli Nanda. 105 He also sung in many movies such as Laawaris, Toofan and Silsila. 107 Was named Actor of the Millennium in a BBC News Poll ahead of such luminaries as Charles Chaplin, Sir Laurence Olivier, and Marlon Brando. 108 The highest paid Indian actor from late 1970s to 1992. 112 Father of actor Abhishek Bachchan and father-in-law of actress Aishwarya Rai Bachchan. 113 Suffered from a rare muscular disorder known as myasthenia gravis. 114 When he was just trying to get a break in movies he was told to soften his 'deep' voice. However it was soon realised that his deep rich voice was excellent for narration. He has provided narrations for several films. 115 Went to Sherwood College, a boarding school in the hill-station town of Nainital, and from there to Delhi University where he earned a double MA degree. 116 Was a former stage actor, radio announcer and freight company executive in Calcutta, India. 117 While filming Coolie (1983) he received a near fatal injury. He was hospitalised and the Indian press issued daily bulletins on his health. 118 Was one of the judges for the 1995 Miss World beauty pageant. 119 Had a close association with the former Indian Prime Minister Indira Gandhi and her son Rajiv Gandhi (also Prime Minister) and he was elected to parliament with a huge majority from his home town of Allahabad. But his stint in politics did not last long and he was implicated in the infamous Swedish Bofors Gun deal scandal along with Rajiv Gandhi, the U.K. based Hinduja brothers, and others. Later Amitabh Bachchan was cleared of charges of involvement in this scandal as the former Swedish police chief Sten Lindstrom confirmed that Amitabh Bachchan's name was 'planted' by the Indian agencies in the Bofors case. 120 He launched a multi-faceted commercial enterprise known simply as Amitabh Bachchan Corporation Limited, or ABCL. ABCL is engaged in production, distribution and all other aspects of the entertainment industry. It was the first of its kind attempt at corporatising Entertainment industry in India. 121 Biggest Star of 1970s and 1980s in Indian cinema. Te3n 2016 performer: "Kyun Re"
Wazir 2016/I performer: "Khel Khel Mein", "Atrangi Yaari"
Paa 2009 performer: "Mere Paa"
Bhoothnath 2008 performer: "Chalo Jaane Do", "Mere Buddy", "Mere Buddy - Repeat"
Ram Gopal Varma's Indian Flames 2007 performer: "Mehbooba Mehbooba"
Baabul 2006 performer: "Kaheta Hai Baabul Oh Meri Bitiya"
Dev 2004 performer: "Dev Speaks"
Baghban 2003 performer: "O Dharti Tarti Ambar Tarse", "Holi Khele Raghuveera", "Main Yahan Tum Wahan", "Chali Chali Phir Chali Chali"
Kabhi Khushi Kabhie Gham... 2001 performer: "Say Shava Shava"
Sooryavansham 1999 performer: "Chori Se Chori Se"
Lal Baadshah 1999 performer: "Ek Dinak Dinnah Din", "Pathiye Ley"
Akayla 1991 "Chal Chal Meri"
Jaadugar 1989 performer: "Padosan Apni Murghi Ko"
Mahaan 1983 performer: "Jidhar Dekhoon"
Laawaris 1981 performer: "Mere Angne Mein Tumhara Kya Kaam Hai male"
Naseeb 1981 performer: "Chal Mere Bhai"
Mr. Natwarlal 1979 performer: "Mere Paas Ao Mere Dosto"
The Great Gambler 1979 performer: "do lafzon ki hai dil ki kahaani"
Don 1978 performer: "Khaike Paan Banaraswala"
Amar Akbar Anthony 1977 performer: "My Name Is Anthony Gonzalves"
Kabhie Kabhie 1976 "Kabhi Kabhie"